On Thursday night, August 30th in Portland, Oregon, The Toffee Club welcomes football muralist and artist Martin Gordopelota for an evening of art and soccer. Guests can watch a Boca Juniors match with Martin at 3:30 PM and then spend the evening chatting with Martin to learn more about his work and philosophy on football life and the inspiration behind his latest piece, a mural inside the Toffee Club. Martin will have 10 limited edition prints available on the night of the mural event. These are ten of a 35 print run. Martin will sign and dedicate each picture. The prints are protected and can be shipped. Look at the picture above and notice the football player on the top of the trophy. Yes, he is holding a cigarette and a beer! Toffee blog writer Peter Erdahl talked with Martin Gordopelota about the meaning behind the piece and why this print represents Martin's view on football culture today. This chant, echoed by fans and players around stadiums throughout the world has become synonymous with the achievement of professional footballing greatness. As the winning team’s captain raises the trophy to the sky, we are reminded of the long, arduous road traveled to becoming champions in the world's most popular sport. We watch players who have reached peak physical and mental fitness, defying the odds to bring glory and joy to their respective fans, clubs and countries. This is not the world represented in the art of Martin Gordopelota. Instead, Martin captures the five a side culture of football in Latin America with an emphasis on his home country of Argentina. A football where warmups are few and beers and cigarettes are plenty. Lifting a league trophy at the end of the season is no less important, but the difference in skill, fitness and even mental fortitude when compared to the perfect bodies of the professionals is striking and something Gordopelota finds fascinating. The title of the print Mens Sana In Corpore Sano means a healthy mind in a healthy body. 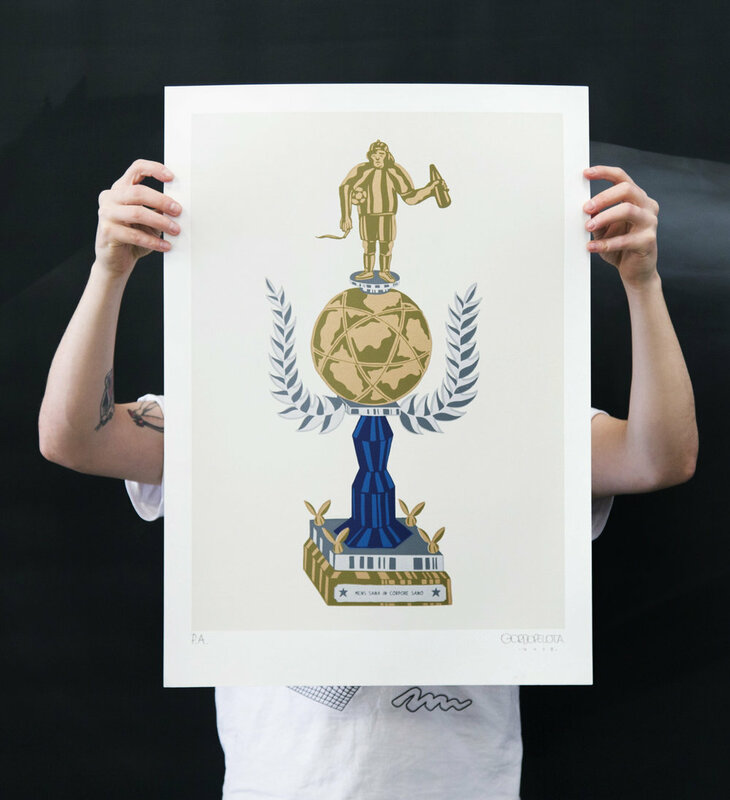 Gordopelota spins this concept and captures the essence of amateur football by replacing the athletically perfect football champion that usually sits on top a trophy with his smoking, drinking amateur counterpart. A true nod to the average amateur football player. We have 10 limited edition prints of this piece available to purchase during our mural event.